Belmont University was presented with The Benefactor Award, from the Tennessee Recreation and Parks Association, at a ceremony held at the Metro Parks Office today, December 5. 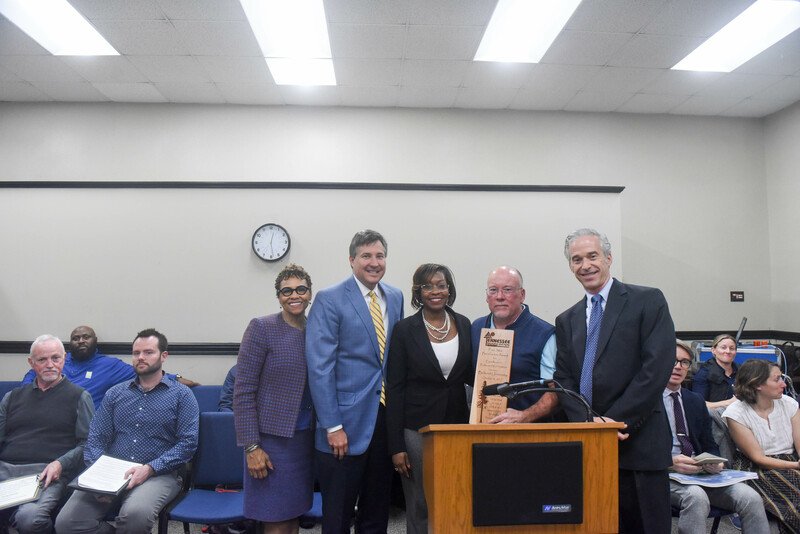 The University’s recognition was given in honor of its work with Nashville’s parks system, sports and athletics, including its contributions to E.S. Rose Park Community Center and Sports Complex. Rose Park was renovated and opened in 2011 through a public-private partnership between Belmont and Metro Parks. The $9 million renovated facility features several athletic venues including a turf baseball field, a natural grass softball field, a track, soccer facilities, relocated basketball courts and a center that provides team locker space and a concession stand. This innovative, shared facilities concept is available for use by community members, Metro Parks, area schools and Belmont University students and teams.